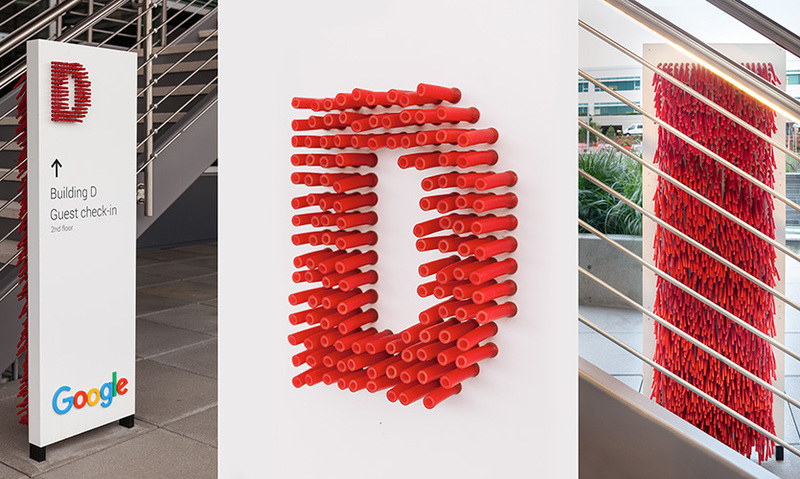 Google Wayfinding signage detail by Studio Matthews. 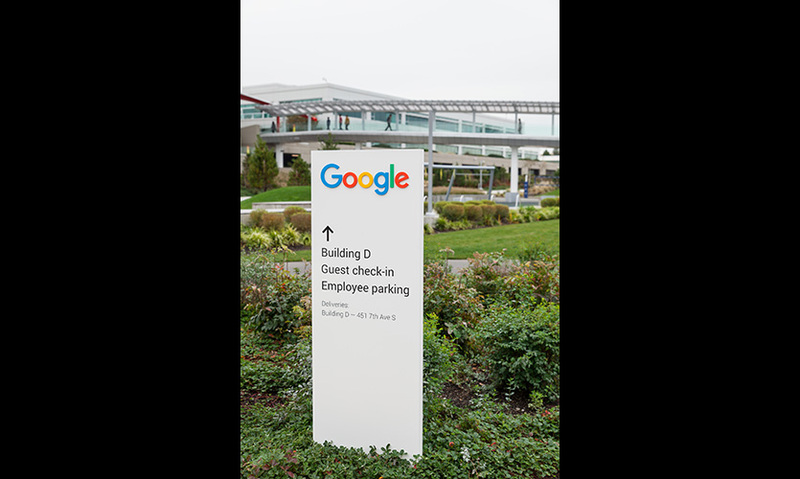 When Google’s Kirkland campus was set to dramatically expand, they needed a new wayfinding scheme for both Googlers and visitors. The desire was a design approach that was innovative in the way it reflects the company’s values and attitude. Google’s founders are strong believers in the Montessori method of learning and working, which emphasizes making use of all of the five senses. This ideology inspired the design solution: each building on campus can be identified by a different texture, letter, shape and color related to Google’s brand. 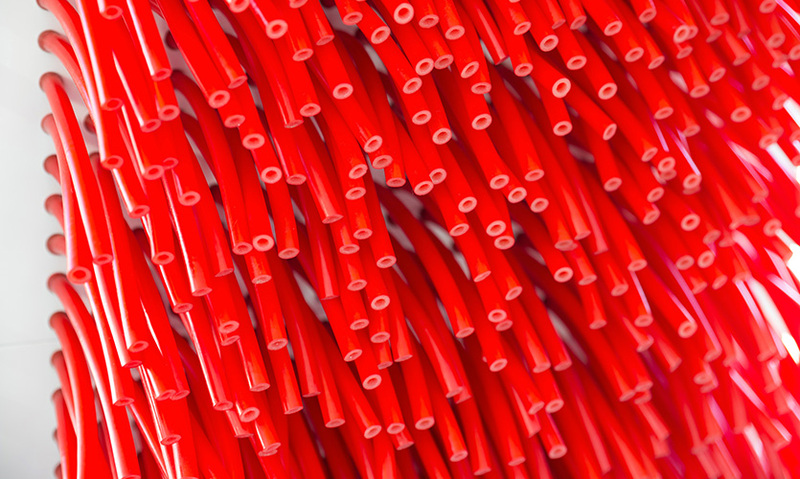 Tactile signage detail featuring red rubber tubing. 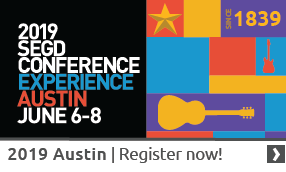 The design was intended to reflect the colorful, contemporary quality of the Google brand. The wayfinding plan includes approximately 20 signs, plus architectural color treatments at four entry points to buildings. The scope covered concept design through construction administration. 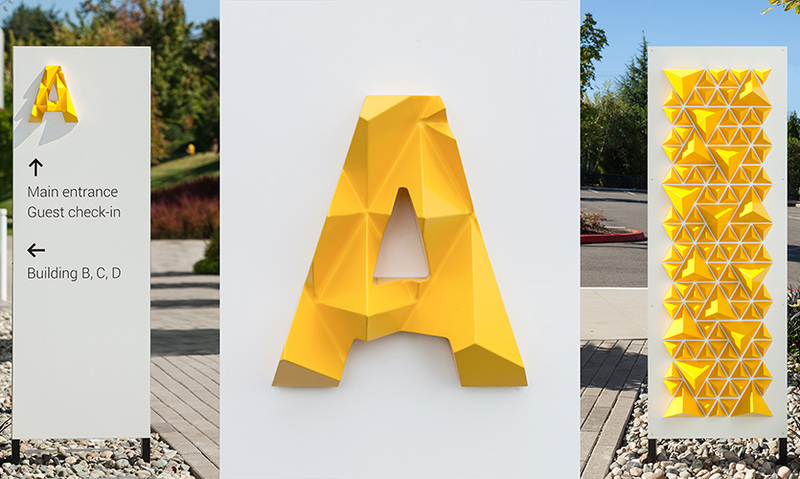 When Google’s Kirkland campus was set to dramatically expand, they needed a new wayfinding scheme for both Googlers and visitors. The desire was a design approach that was innovative in the way it reflects the company’s values and attitude. To that end, the design team discovered that Google’s founders are strong believers in the Montessori method of learning and working, which emphasizes making use of all of the five senses. This ideology inspired the design solution: each building on campus can be identified by a different texture, letter, shape and color related to Google’s brand. Google’s Kirkland campus is characterized by a series of very similar looking buildings. A very large new building—almost doubling the square footage of campus working space—was slated to open in 2016 across a lengthy pedestrian bridge. This dramatic expansion made wayfinding on the campus far more complex. Visitors can now park in multiple locations and buildings, but must funnel through a consistent, secure entry point. Studio Matthews’ wayfinding scheme included assessment and strategy for the complete campus and inserted both pedestrian and car wayfinding, including changing traffic patterns in some locations. The Kirkland campus sits in a green, non-urban setting, so the design was intended to reflect the colorful, contemporary quality of the Google brand while simultaneously not “shouting at the neighbors.” The wayfinding plan includes approximately 20 signs, plus architectural color treatments at four entry points to buildings. The scope covered concept design through construction administration. The signs’ tactile quality invites touch. As the light shifts from day to day and season to season, the dimensionality of the signs creates a changing shadow play, making them highly memorable. Google reports no wayfinding issues despite the dramatic increase in the size of campus. Feedback has been very positive on the look, feel and inventiveness of the sign scheme. Google always wants to be on the forefront of innovative design, and that includes their working environments. 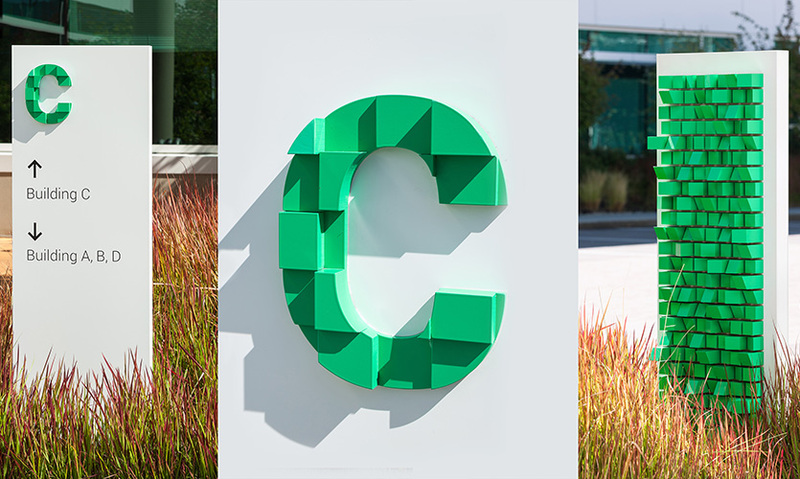 The signs are seen as a positive embodiment of Google’s brand and attitude. "I just love everything about this project! 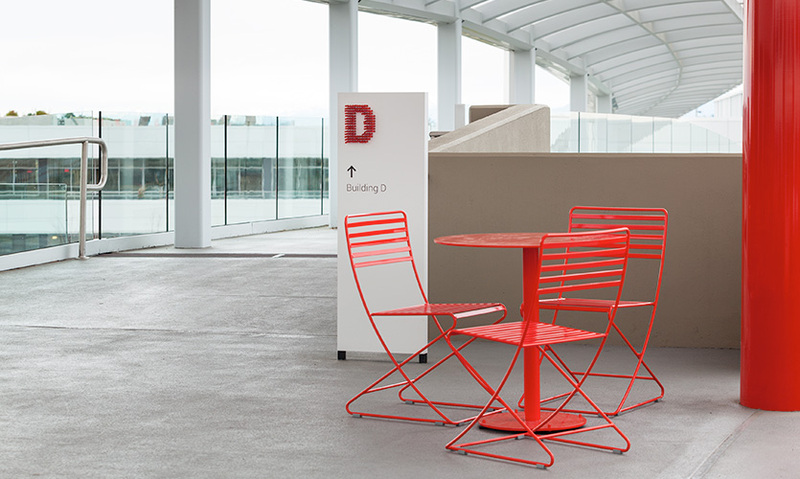 It is a perfect blend of a concise wayfinding system mixed with a subtle nod to the company values. It is clearly on brand and makes me want to experience it in person." "I laughed so hard when I first saw the noodle sign! In a world where an unfortunate amount of wayfinding is uninspiring and boring, it's refreshing to see this shining example. 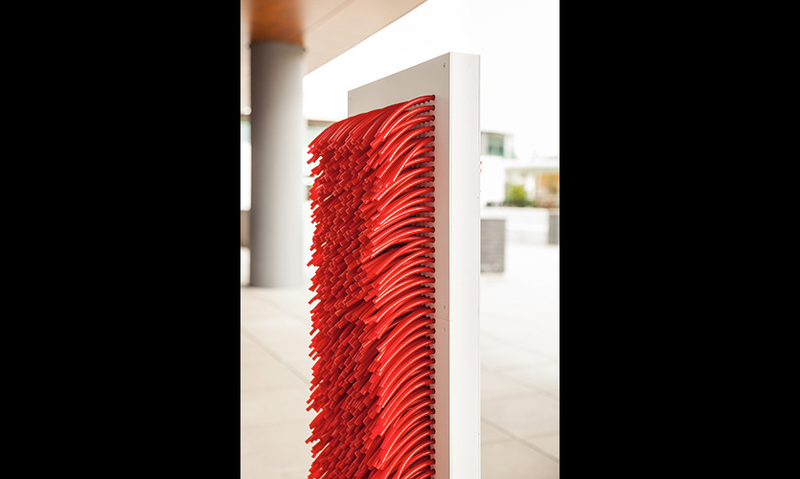 It combines humorous material choices, typographic restraint, elegant fabrication and beautiful documentation. When viewing these in person, I feel like I would be so enamored I'd forget where I was supposed to be going—very well done." 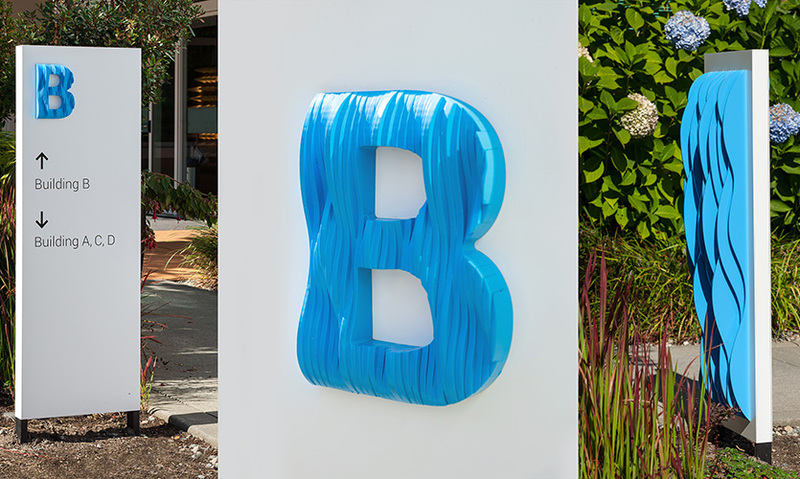 "The brightly colored sculptural letterforms that reference the company's brand entice both the visual and tactile senses and 'pop' from the clean white sign forms. The magic in this scheme is evident in the surprising treatment of the rear of the signs. This treatment put a smile on my face."